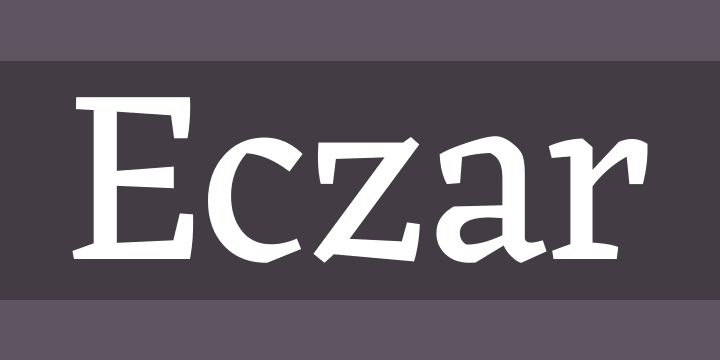 Eczar is an open-source type family published by Rosetta with generous financial support from Google. The fonts support over 45+3 languages in Latin and Devanagari scripts in 5 weights. It was designed by Vaibhav Singh (@errorsinc), code and production is by David Březina (@MrBrezina). Eczar started as a student project in 2010–11 during Vaibhav’s MA studies in Typeface Design at the University of Reading. Eczar was designed to bring liveliness and vigor to multi-script typesetting in Latin and Devanagari – with the intention of providing an alternative to existing designs by imparting a strong mix of personality and performance, both at text sizes and in display settings. The family offers a wide expressive range and the display qualities of the design intensify with corresponding increase in weight, making the heaviest weights best suited for headlines and display purposes.